Anyone who has experience with Tarot cards is familiar with The Tower card. Arguably the most dreaded card in the deck (worse even than Death which simply signals transformation), the Tower portends dramatic upheaval, tragedy and destruction. It is usually illustrated with bodies falling from a burning tower. So, when I picked this card at a recent networking event, it should not come as a surprise that I was less than thrilled. I had the choice of which card to pick and, while I usually like to fan out the cards and choose one that calls to me from the middle of the deck, this time I decided to tempt Fate and take whichever card happened to be at the top of the deck. Fate seemed to answer my call with a raised middle finger. My experience with the Tarot started in high school. I would read my own cards in hope of discovering a brilliant future (usually in the form of a much wanted boyfriend) and to find my way through my adolescent melancholy. 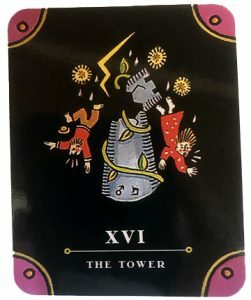 During this turbulent time, my whole life at felt like a burning tower of sadness and pain and the Tower card was a frequent visitor in my tarot readings. When I emerged into a somewhat happier adult life, I left the Tarot and the Tower card behind me. Now, unexpectedly, I found the Tower was haunting me again. I kept trying to look for benign and sunny interpretations. The Tower suggests the destruction of old ways of thinking, and misguided ideas. It marks the burning away of old ego patterns. The destruction of the Tower makes space for new seeds to be planted and new structures to be erected. Plus, everyone knows that there are really no bad cards in the Tarot. Like in life, every card plays an important role in our spiritual evolution. Yet, still there was fear of all the things that could wrong in my outer life. Would there be an issue with my health, my finances, my career, my children? So many things to fear in this world. I had tempted Fate and she answered me. I said I was brave. I asked her to bring it on. And, she revealed my fear. Did I trust her? Was I ready to surrender to ANYTHING? To release my fear of the process of life? Tarot cards do not hold the power. We do. At best the Tarot reveal our internal states. What we already know to be true on a deep intuitive level. They are communication with our deepest selves. They are tools, like everything else in life, to serve us in our awakening. This story is not really about the Tower card. It is about my fear. It is about my relationship with the process of life. Surrendering to life means allowing the process. Sometimes our experiences in life can be really frightening. And sometimes the fear itself can be the scariest thing of all. The Tower card may foretell unfortunate events, but few of us make it through life completely untouched by tragedies big and small. Rather than resisting what may be, I will try to stay present and surrender to the flow of life with a deep sense of ease and grace.